Note: I’ve been away from writing here for the past 6 weeks or so. My writing will continue to be less frequent than it used to be, but my plan is to at least write something once a week. Hopefully, it can be more frequent than that, but we’ll see how things go. I chose this post’s topic to return to writing because, as fate would have it, I’ve recently become a dad! As some of you know, I like to use my favourites on twitter to accumulate things I want to write about or read. As I haven’t been writing very much in the last little while, the list of my favourites that I want to write about has grown — quite a bit. There were two tweets that I’d been saving to write about because I knew that it would fit perfectly with my return to writing. Both were about parental leave. 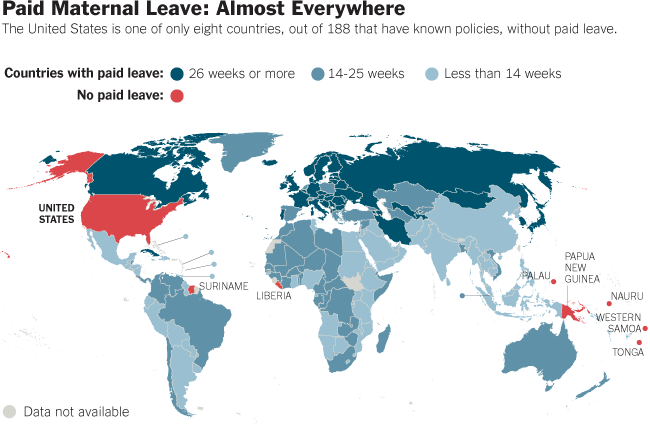 As you can see from the map above, the United States is the only western country that doesn’t have paid maternal leave. Of course, you’ll find that many companies offer paid maternal leave for people in the US as a way to stay “competitive,” but this isn’t something that’s required by law. This is a travesty. Unequivocally. Nothing is more important for a child’s growth than having their mother near in the early stages of life. Nutrition is tantamount to the survival of the child, but so is tender loving care. Swedish parents now receive a total of 480 days of leave per child, 390 days of which is paid at 80 per cent of salary (up to a maximum of $162 a day). Quite frankly, the necessity for maternal leave is so obvious that one shouldn’t even need to argue for it. Instead, the debate should be about how long maternity leave should be. While the US continues to shirk its responsibility to mothers, there’s an interesting argument that offering (more) paternity leave would help to close the gender gap. It’s certainly a compelling argument and the study in Quebec lends credence to the idea, but I think this is another one of those “no-brainer” kind of policies. Of course there should be paternity leave. Of course fathers should be there for their young infants and the new mothers. There is so much work required in the early stages of an infant’s life that I can’t imagine a mother trying to do this all by herself. And as history would tell us, they’re not meant to. Only recently has our society shifted in a way that it’s become the “norm” for mothers to stay at home by themselves and tend to the children. As a new father, I’m embarrassed by this. If we want to do right by our families, our countries, our societies, and the world, we’ve got to take more time to spend shaping our young ones who will inherit the world.